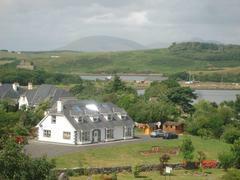 Its a family friendly Irish Tourist Board approved B&B located in a highly scenic area on the edge of Westport town. This modern purpose built B&B, which is family run, is located on the shores of Clew Bay close to the Harbour with its Pubs and Restaurants. Its an ideal base from which to tour the many scenic, cultural, historical and educational sites in the West. Visitors to the area include cyclists, anglers and golfers. Check In/Check Out : Rooms are available from 3pm but may be available on request. Please note that if you are arriving early and would like to leave luggage before going out to enjoy your day that this can be arranged too. From the Octagan monument in Westport town travel on the Coast Road out to Westport Harbour. Rosmo House is located a short distance past the Towers Pub on the right hand side of the road. It is before the Shebeen Pub.